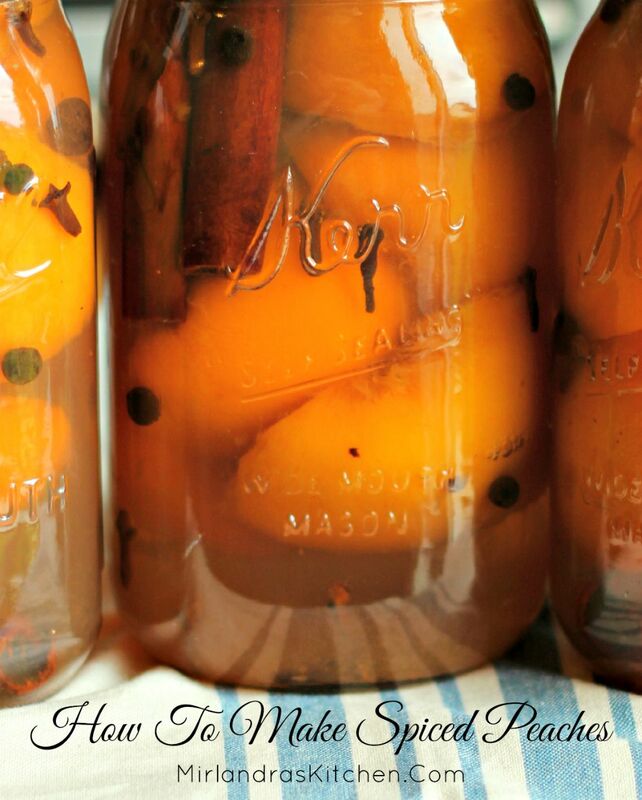 Home canned spiced peaches have all the flavor and beauty of plain peaches with a little extra. The addition of cinnamon and allspice and cloves creates a spicy treat worthy of dessert. It is always easy to whip out a jar of these and serve with some vanilla ice cream for any dinner or special occasion. My Grandma Madge made amazing spiced peaches. You may have heard of these referred to as pickled peaches. Most people can peaches in sugar syrup and call it good. Some people throw in a cinnamon stick. A few do a serious pickle with some spices and vinegar. I even came across a recipe for honey canned peaches with some spices. However, I think my grandmother’s recipe is unique. Her peaches are canned with spices in a sugar syrup and then they sit for a bit. We usually open the first jar sometime in the middle of fall and see how they are coming. Every month the peaches get more spicy! I eat the plain for breakfast or serve them for dessert over ice cream. If you are a fan of brandy you could always open a jar and spike it. There are quite a few options! Note on Green Peaches: Sometimes when you order a bushel of canning peaches from a farm they are sold green and cold from a refrigerator. Peaches should be canned when they are as ripe as possible while still being firm enough to hold up. If yours are green bring them home and set them out on newspaper or towels on a table in the sun for 2-3 days until they become more yellow/orange/red and start giving off a pleasing peach fragrance that fills the room gently. If you do find yourself canning peaches that maintain a bit more green to the skin try blanching for 45 seconds instead of 30 to make sure the skins still slip off well. If you are new to canning try my Water Bath Canning: Tips and Equipment post. If you missed my other peach canning project, check it out! Spiced peaches are a wonderful alternative to regular canned peaches. The addition of whole spices creates a savory treat everybody will love all winter. Prepare your water bath canner and clean jars. Start the canner coming to a boil. If it is ready before the fruit you can turn it off. It will come back to a boil very quickly when you are ready. Put spices into the jars. 1/2 teaspoon of whole allspice, 1/2 teaspoon of cloves, 2 whole cinnamon sticks per jar. Prepare desired sugar syrup by heating water and sugar in a sauce pan until sugar is dissolved. Set it aside. Blanch peaches by dipping in boiling water for 30-60 seconds. Use a large slotted spoon and do 5 peaches at a time. Immediately remove peaches to a sink or bowl with ice water to stop the cooking. Slice each peach in half along the natural line of the peach. The skin will slip off easily after it is cut. Remove skin, pit, and any little fragments of pit left in the peach. Fill one jar at a time. Each peach half is supposed to be packed pit side down. As you fill a jar, cover the peaches with hot syrup leaving 1/2" head space. Load 7 quarts into a boiling water bath canner. Make sure the jars are covered by at least 2" of water. Remove jars of peaches and place on a towel to cool. Allow them to come to room temperature. The lids will seal at this time. Any lids that do not seal need to be processed again or refrigerated and eaten within a week. Sealed jars can be labeled and stored on a shelf out of direct light. Can you make this using pints? Do you have to blanch ripe peaches or can you eliminate this step? Sorry for the delay in getting back to you. I just had a baby and I’m a bit behind on emails and comments right now! If your peaches are VERY ripe you can probably slip the skins right off. Blanching helps of the peaches are being difficult and you can’t get the skins off easily. Basically it is up to you how you would like to do it! These sound amazing! I’ve had spiced pears before, but this is perfect for peach season! Can’t wait to make these! Thanks! I have never done spiced pears but I really need to try it this fall! It would be wonderful. Hello. 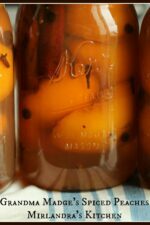 I made this recipe a few days ago and all seems to be well, however when i took the jars from my canner i noticed that some of the syrup had come out of the jars during the half hour that they were processing. Only a frectional amount of liquid was lost, so little thst i would not have noticed save that the outside of the jars were a little sticky. 2 days later, the seal still holds and the contents appear to be fine. What do you think? Thanks! Hey Peter, Great question! It is normal to loose a bit of the syrup during the canning process. When it is just a small amount there is no concern according to USDA. If you were to loose say half your liquid or something crazy the safe bet would be to refrigerate and eat the fruit asap. I hope that helps! Also I’ve learned from experience that removing the ring lids and rinsing both the ring and jar makes it easier to get the lids off after a year of storage! Nothing worse than feeling like you can’t get into your peaches!